If there is one must-have for Summer, then it’s maxi skirt. This is one of the most versatile pieces known in the fashion world. Personally, I think every lady should have at least one maxi skirt in her closet. I see no reason why can’t you own at least one maxi skirt this year. I gathered a great compilation of street style images where ladies appear in this awesome garment wearing on the streets during hot Summer days. Anyway, I’ve got important advices for you why you should be rushing to the store and grab some maxis. Read on to find out more about this feminine must-have piece. First of all, maxi skirt goes with tons of tops. This is an extremely versatile garment that can be either styled with casual or dressy tops. Believe me, you will never go wrong with this beautiful garment. This attention-grabbing piece can be paired with a ladylike blouse and fitted blazer, or you can create a laid-back look by teaming this maxi bottom with a simple graphic tee or chambray shirt. If you want to keep things edgy, then the best way is to pair a maxi skirt with a cool biker leather jacket. Those ladies who feel themselves like little princesses, then I advise pairing fluffy maxi tulle skirt with a washed blue denim jacket. Never forget to complete your outfit with accessories that will underline your individuality. You don’t have to spend much money on maxi skirts. There are lots of designs for a pretty affordable price. Even designer pieces go on sale periodically. It’s very important to buy a maxi skirt that has a comfortable fit. Anyway, I would love to hear your own thoughts about this stunning bottom garment. Do You have any thoughts about Maxi Skirts For Summer? 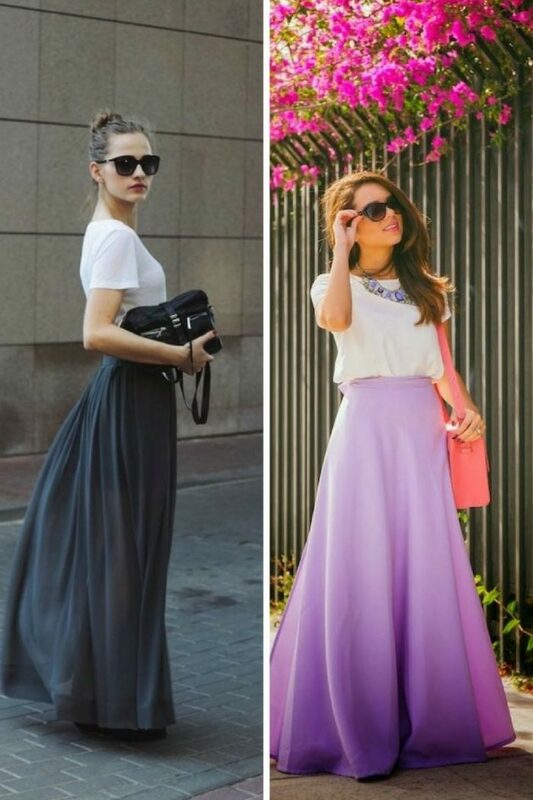 Here are Fashion Tips pictures and trendy women’s outfits which are in style in 2019: Best Summer Fashion For Ladies, How To Wear Maxi Skirts, Maxi Skirts Trend, Must Have Fashion Trends For Women, Street Style Women's Fashion And Inspiration and tips on how to wear them on the streets.